We love sharing success stories about our students. STEM students William Berrios, Giovani Rodriguez, and Colin McGill recently delivered a superb research presentation at the 2014 SACNAS (Society for Advancement of Hispanics/Chicanos & Native Americans in Science) National Conference in Los Angeles. While at the conference, judges recognized the team’s work, titled "Closed-Loop Feedback Temperature Controlled Encasement to Test Optimal Temperature for Poly Lactic Acid (PLA) and Acrylonitrile Butadiene Styrene (ABS) Polymers for the Punchtec Connect XL 3D Printer," as a standout among the student presentations, and have selected the team to receive one of the 2014 SACNAS Student Presentation Awards. 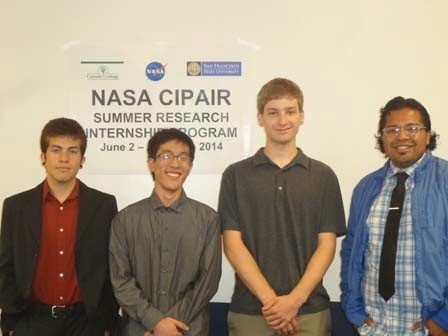 Cañada College Engineering student Jeremy Chow was also a part of the internship project team. SACNAS was founded more than 40 years ago by career academics and research scientists committed to unifying their voice and offering guidance to Hispanics/Chicanos & Native Americans in the STEM fields. Today, the National Conference gathers nearly 4,000 students and professionals. Taking place over three days, the conference showcases both undergraduate and graduate student presentations, and offers scientific symposia, keynote addresses, professional development sessions, and a grand exhibit hall in which students can interact with over 600 program representatives from colleges and universities across the nation. The Cañada College team’s presentation was part of a 2014 internship project in which they participated at the "Creating Opportunities for Minorities in Engineering, Technology, and Science" (COMETS) program, a collaboration between Cañada College's Engineering Department and San Francisco State University School of Engineering. This program is sponsored by the National Aeronautics and Space Administration (NASA) Office of Education through Curriculum Improvement Partnership Award for the Integration of Research into the Undergraduate Curriculum (CIPAIR). We are very proud of William, Giovani, Colin, and Jeremy -- congratulations!